As I’ve previously mentioned I purchased a Microsoft Surface Pro 2 to replace a number of my older computers. I’ve already wiped my Toshiba R705 notebook in favor of using the Surface Pro 2 when I need to carry a notebook for business. But that isn’t the primary role I see for the Surface Pro 2. It is replacing my old Dell XPS One All-In-1. So now I’m watching an episode of Covert Affairs while making a blog post. And over on my Surface’s display I’m keeping an eye on email. It’s a sweet setup. A few notes on hardware. My Surface Pro 2 is an 8GB/256GB SSD configuration. In the final configuration I’ll add a 1TB hard drive so I have space for multiple VMs. The monitor is an Acer 23″ Touch Monitor. It was the only Touch Monitor that Best Buy carried. It is also the one that the Microsoft Store is using to demo the Surface Pro Dock, though the Microsoft Store isn’t actually selling them. Moreover, on the Best Buy website it is on sale for $399, and of course the store matched that price. I could have mail-ordered a different model, from Dell for example, but I didn’t want to wait. And without being able to see them all in person I don’t see how I would have decided to spend more money anyway. So far I’m quite happy with my purchase. The jury is still out on the Surface Arc Touch Mouse, but I think I’m going to like it. The Sculpt Comfort Keyboard is more of a question-mark. It definitely takes some getting used to. I’m using a Belkin 4-port powered USB Hub to bring everything together, which basically means the monitor, my Fitbit dongle, and the dongle for the keyboard. The mouse uses Bluetooth. So now I have one system to meet all my mainstream computer needs. I’ll do a similar setup in my offsite office and then I’ll just move my system unit (the Surface Pro 2) with me between home and the office. This will be really simple once I can get my hands on a couple of docks! One more thing. With this set of changes every computer in my home has a touch screen. So when the urge strikes to reach out and touch some one or thing it will always work. This entry was posted in Computer and Internet, Microsoft, Windows and tagged Microsoft Surface Pro 2, Surface Dock, Surface Pro. Bookmark the permalink. Yes, I was surprised to see the Acer monitor in your setup given their CEO’s comments about Microsoft. Ah, I see Wang got replaced by Wong. Maybe that will improve their relationship with Microsoft. Wow, touch monitors are expensive! 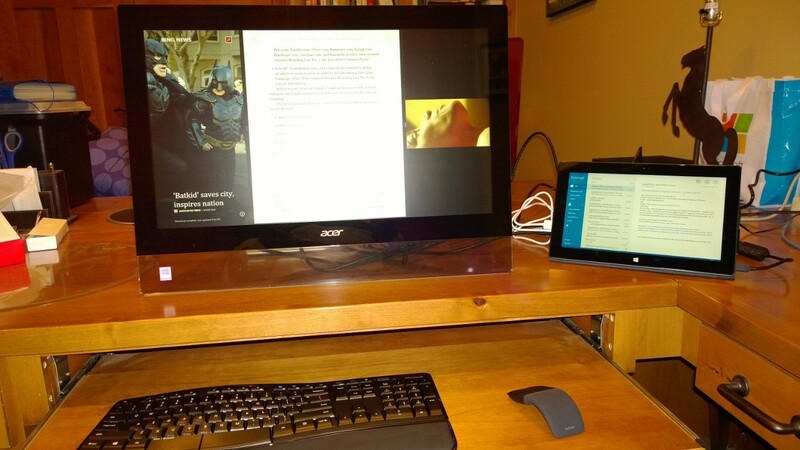 Your Acer 23″ touch monitor cost more than twice as much as my older Acer 23″ non-touch monitor. Wang’s departure did open up a window for me to consider buying Acer products. Surface Pro battery life. Fail. 10″ screen for real work. Fail. Surface RT or Surface 2, as a laptop companion, for keeping in touch via email, Facebook, and Skype, and reading from browser and Kindle, and reading Office docs, good. Very good. I’d like to hear Hal’s take on this comment. In Hal’s case, he’s got a docking solution at both the home and office, so the Surface Pro 2 is not at all a fail. And for the occasional hour here or there when not at either location, I would think it is sufficient even for demanding work. The one thing that has crossed my mind recently is whether a Surface RT/2 could suffice if I started using Azure VMs for my primary work environment. Scott Hanselman has a good post on this scenario: http://www.hanselman.com/blog/UsingASurface2RTARMToGetActualWorkDoneRemoteDesktopVisualStudioAzure.aspx. The two issues there are (1) cost and (2) connectivity. The former is probably not an issue for anyone with a MSDN account. And the latter is probably likely not an issue unless you’re on a plane or in the wilderness. You really need to define “real work” before labeling something as “fail”. The 10.6″ screen is definitely not a good screen size for software development, other engineering disciplines, call centers, or many other intensive activities. But it can be a primary screen for mobile information workers, who are every bit as much doing “real work” as anyone using a computer. And a great counter-example on that class screen size is the extremely popular 11″ MacBook Air. So for some people the 10.6″ screen is ok for a primary mobile device while for others it may not be. Your battery life point on the Surface Pro is a good one, a comparison with the MacBook Air makes it look terrible. They either should have released the Surface Pro earlier (for all kinds of reasons) or delayed it a couple of months to go with Haswell. Or the battery keyboard cover should have been targeted at release months ago. In any case, the Surface Pro has been replaced with the Surface Pro 2 that has much better battery life out of the box and the power cover is coming. I don’t think the Surface Pro 2 has any real battery life issue. To me the battery life point is somewhat of a red herring anyway, at least for a notebook-replacement. Yes it is nice to go all day without plugging in. The number of times that you have to do that in a year is probably in the single digits. Or zero. On international flights there are power outlets, and I just got email from United that they are adding them to the domestic fleet as well. That’s just an example. The Surface family was designed for quick charging, so you can recharge in an airport lounge between flights. Or while visiting your local coffee shop. Is that a justification for non-competitive battery life? No. All mobile devices should have the ability to go at least a full traditional work-day (8 hours) under typical use. I have not yet run Visual Studio on my Surface Pro 2. But I have used RDC on my Surface RT with VS running on another computer, so I have an idea of the user experience. On the 10.6″ screen and Type Cover you could certainly fix a bug or work on a feature while sitting at your mother’s kitchen table, or on the train ride into work, or on an airplane. But I sure wouldn’t try to do that day in and day out. For frequent mobile software development activities I’d go for something a little more true notebook like. Probably in the 13″ range. VS just works better on a larger screen. That’s why I went with 23″ at home and many developers go with multiple monitors in that class. So 10.6″ sure is not the best option for software development. It may be the best option for some developers’ mix of needs though. The Surface Pro 2 is clearly a compromise offering for those who want to carry one device that meets both notebook and tablet needs. So you have the power of a mid-range (or better) notebook in the form factor of a tablet. It’s probably in the middle of the spectrum of devices that can meet both needs (where “low” means more of a tablet and less of a notebook and “high” means more of a notebook that can also be used as a tablet). ARM and Atom-based tablets, often with smaller 10.1″ screens, are at the lower end of the spectrum. 13″ 2-in-1 devices with Core i5 or i7 are at the higher end of that spectrum. So if I were doing software development while on the road all the time I’d probably look at something like the Yoga 2 or HP Split X2 13″ devices. Or split the difference with the Yoga 11S or Dell Venue 11 Pro. Interestingly Dell offers both the “Dell Tablet Keyboard – Mobile”, which turns the Venue 11 Pro into a detachable notebook, and the “Dell Tablet Keyboard – Slim”, which makes the Venue 11 Pro into the most Surface Pro 2-like competitor on the market. But these are screens only slightly bigger than the Surface Pro 2, so I still don’t see them as great development machines. My selection of the Surface Pro 2 came after I realized that most of the time I’d use it in a docked configuration, but then I could take it with me on consulting engagements. Occasionally on one of those trips I’ll wish I had a bigger screen. But that’s probably just once or twice a year. Mostly I’ll be happy I avoided taking two devices with me, which is what I was doing with the Toshiba R705 as my work notebook. But for others the tradeoffs will definitely be different. I work from home most of the time doing software development in a VM on my company issued Dell Latitude E6530 with 16GB RAM and 500GB hard drive connected to an external 23″ monitor. I run Outlook and Lync in 6GB on Windows 8 Enterprise. I have the 8.1 EE image available, I just haven’t done the upgrade yet. I’ve dedicated 10GB RAM to the Hyper-V VM. When I finish a project, I delete the VM and build a new one for the next project. I did try changing the memory configuration to 4GB for the host OS and 12GB for the guest OS, but Lync was constantly complaining about poor call quality and I would get dropped audio, so that wasn’t a viable configuration. Even if the Surface 2 Pro had a larger screen, I probably wouldn’t want to use it for development given the battery drain from running another OS in the VM. I suspect that even if the guest OS on the VM was W 8.1 the drain would be unacceptable. I would think most development on a Surface 2 would occur while it was plugged in. But that said, especially with the forthcoming power cover, you could do a reasonable amount on battery. You are correct that it would be on mains power most of the time just like my E6530 is. I’m thinking about the situation you described where the Surface 2 Pro most likely would be used on battery; on the train to work, or on a non-transcontinental flight, etc. My reasons for concern is that when on mains power and Hyper-V is NOT running my development VM, the fan in the E6530 is not running and everything is cool to the touch. With the VM running, the fan is constantly running and the left half of the case gets very warm and the bottom is almost hot. One advantage the Surface 2 Pro would have is its SSD vs. my hard drive. Unless the Surface 2 Pro runs a whole lot cooler, it seems to me the battery will drain rather quickly trying to run the VM and keep everything cool. BTW, my E6530 is only 6 months old, so the battery should be in good shape. I’ve got the E6530 on battery now. I’ll see how long it lasts before it starts complaining about needing to be charged. Well, I’m surprised. It ran for 3 hours before the battery got below 20% at which time I decided to plug in the power cord. Not bad. 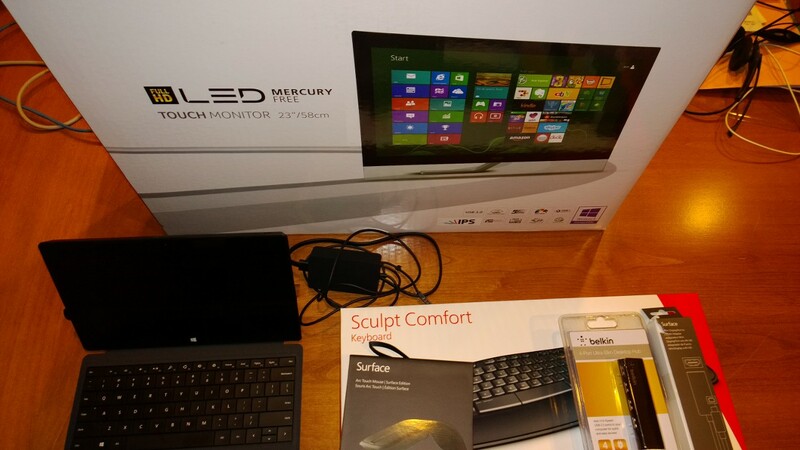 I’ll let you know how the Surface Pro 2 does when I get around to finishing the setup. It might be a few weeks because I have other things on my plate right now. I know I’m not a normal user, I am a software developer who takes long horrible cross country flights often, and spends long periods working at customer sites. But since everyone else assumes that every other user is just like them, I will too. 🙂 But I can say without qualification that the Surface RT has been wonderful for me since day one, while working from home, and while working far far away from home, so I’m sure the Surface 2 will be even better. Recently I’m hearing good things about the Dell Venue and Nokia 2520 some I’m hesitating to upgrade. Did you RDP from the Surface RT into a true dev machine to get stuff done? Or did you not use it that way, but rather just for other things (requirements, etc. )?